Increase the efficiency of UV lamp and how often to replace UV lights, its time period and intensity to replace. Ultraviolet radiation plays a vital role in the pharmaceutical industry to control the microbial contamination in various stages including water system. No chemical is required to add in water; hence the procedure is environment-friendly and safe. A high dose of UV radiation is required to control the microbes and the process can be reversed in the presence of light. This dose should damage their nucleic acid too enough so that it could not be repaired again by the process of photo-reactivation in the presence of light. The energy of the ultraviolet radiation is decreased after a period of burning. The low energy radiation cannot kill the microorganisms and will not help to control the microbial growth. So it is necessary to replace UV lights after a period of time. A wavelength of exactly 2537⁰A or 253.7 nm is used to inhibit the microbial growth. This wavelength is most effective against microorganisms. A dose of 330000 Microwatt-Second/cm2 is required to kill the bacterial and fungal spores. This energy depends upon the distance between the light source and organism. If lamp intensity is 800µW/cm² at a distance of 1 foot then it will give 106µW/cm² at 1 meter. So the distance and contact time both play an important role to inhibit the microbial growth. Vegetative cells take less time than the spores. Bacillus subtilis requires 11000 µW-S/cm² energy to kill. By a simple calculation, we can calculate the approximate exposure time. If Bacillus subtilis cells are placed at a distance of 1 foot then it will take about 14 seconds to kill while the spores require approximate 8 min of UV radiation to kill. 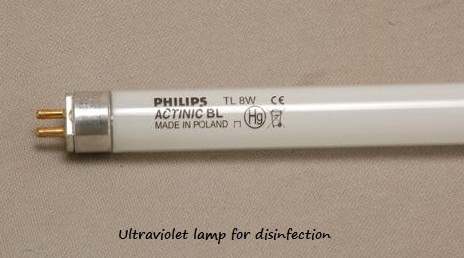 Replacement of UV light depends upon the usage of the UV lamp. Studies show that after every 45 days of burning UV light becomes 5% less effective. So it also depends upon the quality of UV light and usage hours. Some manufacturers claim to replace UV lights after 12000 burning hours and others say to change after 9000 burning hours. But it is recommended to replace UV lights after 6000 burning hours. Some instruments are also available to measure the intensity of these ultraviolet lamps.